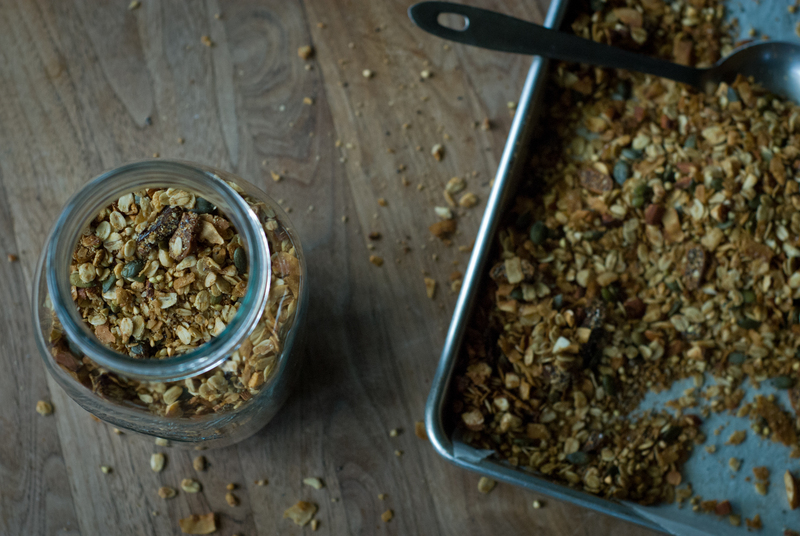 This is my classic granola recipe, give or take a few ingredients depending on what I have on hand at the time. Instead of adding dried fruit at the end, I add it to the mix before it gets baked because I love chewy pieces of fruit in my granola. If little ones are going to be eating this, or if anyone has a hard time with chewing, add the dried fruit in after baking to keep it soft. Feel free to use 4 cups of oats instead of using the buckwheat groats and quinoa flakes, as I know not everyone will have these different and slightly unusual ingredients on hand. Sunflower seeds can be used instead of pumpkin seeds and you can use a different dried fruit if you prefer. Place everything but the last three ingredients into a large mixing bowl and stir to combine. In a small saucepan over low-medium heat, melt the coconut oil or butter. Once melted, add vanilla and honey or maple syrup and stir well. Pour the melted oil/butter mixture over the dry ingredients in the bowl and mix well with a wooden spoon or with your hands until well combined. Spread evenly onto a large baking tray and place in the preheated oven. 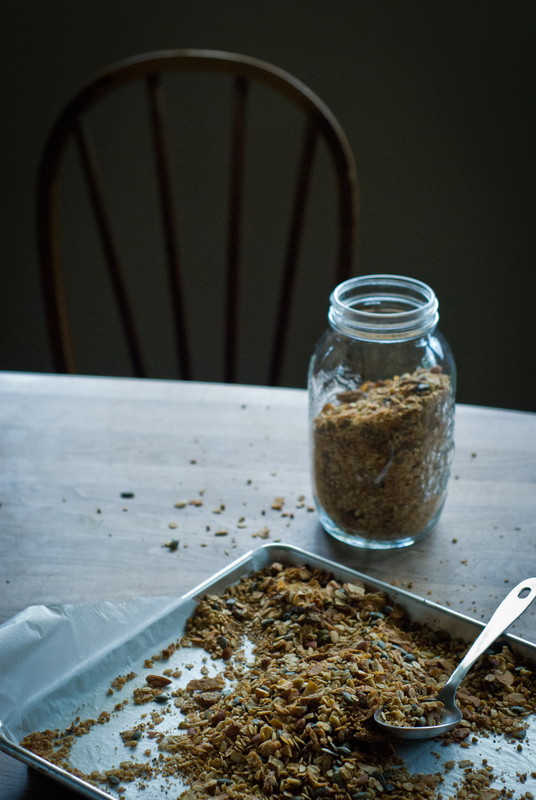 Bake for 10 minutes and then take the tray out of the oven to give the granola a good mix, being careful not to spill it over the edge of the tray. Place in the oven for a further 5-8 minutes. 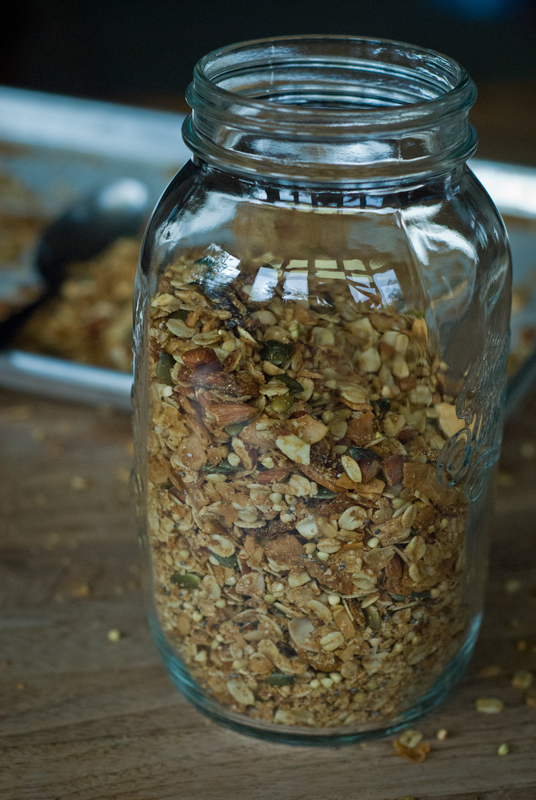 Repeat the mixing, focussing on bringing the outer golden bits of granola into the centre and pushing the centre outwards to get the granola evenly baked. 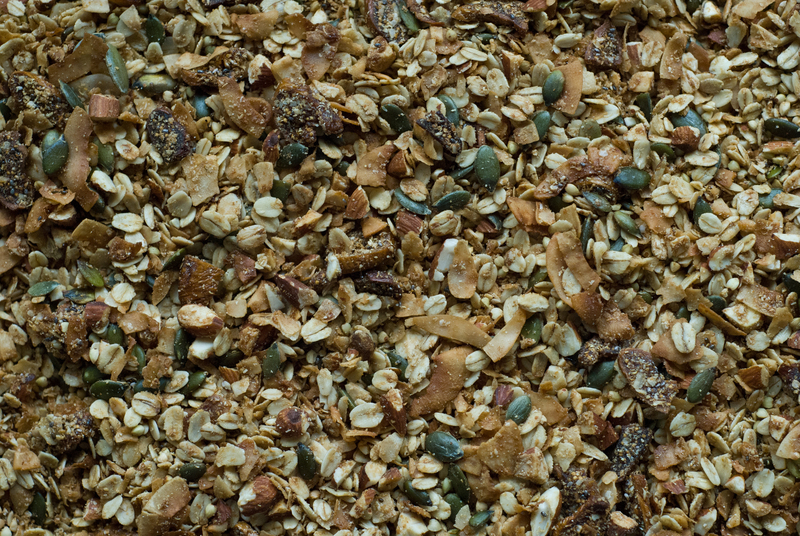 Continue to bake for 5 minute intervals, mixing in-between, until the granola is toasted to your liking. Mine usually takes between 20-30 minutes depending on what I have put in it. The figs will become more chewy as they cool. Store in an airtight container or jar.